Relate screen size to seating distance. For optimum viewing, professional home theater installers recommend a seating distance that’s 2 to 2½ times the width of a screen. For example, place sofa and chairs 54 to 68 inches from a 27-inch screen. Front-projection systems replicate the feel of a movie theater but require complete darkness. Rear-projection systems and picture tube TVs produce a picture that looks good with lights on or off—critical if you’re going to have a party while you watch. Create full surroundsound with five speakers. Place one speaker on each side of the TV screen, level with your ears when seated, and about 3 feet away from sidewalls. Place two speakers behind the sofa about 6 to 8 feet off the floor and at least as far apart as the front pair of speakers. Put the fifth one on top of the TV to direct the dialogue. Action-movie buffs enjoy a sub-woofer that intensifies the bass as well as those dramatic booms and bangs. Position it beneath the screen. In-wall speakers keep the focus on the decor rather than the technology. If wiring a sound system into your room isn’t in your plans, look for slim-profile speakers, especially wireless models, you can stash on shelves. Stash equipment in a ventilated cabinet or shelves so components don’t overheat; be careful not to block the vents on the equipment. For easy access to the backs of all the audiovisual components, construct the shelving or cabinet units 4 or 5 feet in front of the back wall to create a narrow "hallway" behind the units. Tracked halogen-lamp fixtures offer an affordable, custom-look lighting option that’s easy to reconfigure when needed. 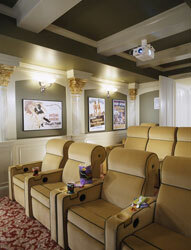 To help set a true theater ambience, install dimmers that allow lighting to glow softly throughout the movie. Plush reclining theater seats provide kick-back luxury and feature deep armrests with built-in cupholders and plenty of room for snacks. Create a similar effect by grouping two or more lower-cost recliners with fold-out drink holders. Curvaceous ceiling baffles deaden the surface for better acoustics. A dropped ceiling can achieve the same effect. If a ceiling treatment isn’t in your plans, include plenty of soft textures to help absorb sound. To enhance the setting, consider building stepped platforms to organize seating stadium-style. For best results, do this in a basement with a 9- or 10-foot-high ceiling, although an 8-foot-high ceiling will also work. Build the platforms with sturdy framing of 4x4s and 2x4s to hold the weight of the furniture and people. Then sheath with ½-inch plywood. Finish the platforms with flooring to match the rest of the room. 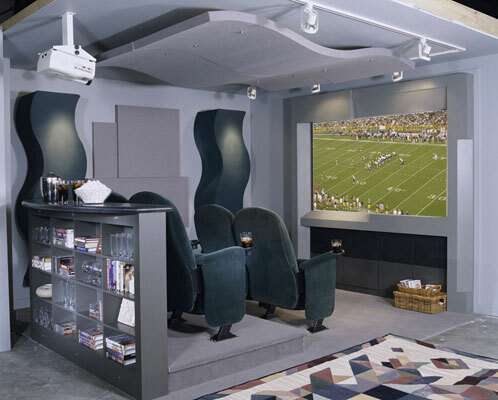 Even a small home theater benefits from stadium seating. Putting a sofa on a riser behind other seating can achieve the same multilevel effect. Or, just make the floor comfortable with soft carpet, pillows, and cushions. Romantic Corinthian columns add a classic Art Deco theater detail. To save money, purchase whole columns from a local lumber company, then cut into halves and quarters before being installed on the walls and in corners. Vintage movie posters give the space an air of authenticity and put viewers in the right frame of mind. Inexpensive prints can be found online and in art stores, and simple, do-it-yourself black plastic frames keep the cost down. Charcoal gray walls keep eye strain to a minimum when the lights go down. Regardless of the color you choose, complement it with soft lighting and consider painting the ceiling, too, to avoid overhead glare. Theater-style seats are usually plush velour, which provides a luxurious feel and additional acoustical advantages. For a practical alternative, turn to microsuede; it’s comfortable, durable, and available in many colors and textures. Add fun accessories, such as popcorn machines, concessions counters, or even a velvet curtain to cover the screen. Get that true "movie night out" feeling right in your own home.